Foramena of skull are opening in the skeleton of human skull through which various structures passes. These structures include arteries, veins, nerves, muscles etc. As we are concerned with the foramena of skull, there are many foramen in skull but here we would mention some of the important one. We would also be list the sturctures that passes via them. In order to help you learn these foramena and their contents , we would be adding some mnemonics that would help you learn these skull foramens. Before going into detail of each of the foramen of skull, first have a look at the names of these foramen and learn their names. After that you would be able to learn the structures that passes through them. Because without knowing these foramen, it would not be possible to learn the structures that passes through them. Now we will discuss all the above mentioned foramen of skull with the names of structures that pass through them. And also mnemonics for them. The most important structure that passes via foramen magnum is medulla oblongata which continues as spinal cord after it passes through foramen magnum. Other structures include vertebral arteries, ascending parts of accessory spinal nerves, membrana tectora and apical ligament of dens. 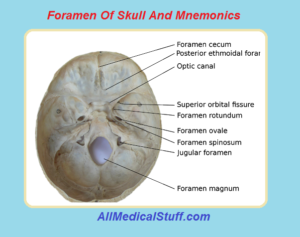 Mnemonics for foramen magnum is MAVer. In this mnemonic, M is for medulla oblongata, A is for ascending spinal nerves and Ver is for vertebral artery. Maxillary nerve which is the second branch of fifth cranial nerve, called trigeminal nerve passes through this foramen rotundum. Mandibular Nerve which is the third branch of trigeminal nerve. Anterior trunk of middle meningeal artery occasionally. The mnemonics for foramen Ovale is MALE. M is for Mandibular Nerve, A is for accessory meningeal nerve, L is for lesser petrosal nerve and E is for Emissary vein. Three structures pass via foramen spinosum. They are: Nervous spinosum, Emissary vein, and Middle menengial artery and vein. To learn the content of foramen spinosum, you just have to keep in mind MEN. In which M is for Middle menegial artery and vein. E is for emissary vein and N for nervous spinosum. Meningeal branch of Ascending pharyngeal artery. M is for Meningeal branch of ascending pharyngeal artery. E is for Emissary vein. I is for internal caroid artery. And G is for greater petrosal nerve. Via it passes facial nerve which is the 7th cranial nerve. It also contains stylomastoid branch of posterior auricular nerve. The nerve that passes via this foramen has the name of this foramen so it is quite easy to remember. The name of that nerve is zygomaticotemporal nerve. It is the fissure that separates the floor of orbit from lateral wall and transmit few structures. The structures that it transmit are: ophthalmic vein and other infraorbital vessels, maxillary nerve (zygomatic branch) and the ascending branches of the pterygopalatine Ganglion. Abducence nerve which is sixth cranial nerve. Ophthalmic vein (both superior and inferior divisions). Ophthalmic branch of trigeminal nerve. As the name suggest, this foramen is located above orbit. And it provides a path for transmission of supra orbital nerve and vessels i.s supra orbital artery and supra orbital vein. The Greater palatine artery and nasopalatine nerve passes via this canal. Via the two vessels passes that has the same name as this foramen i.e greater palatine artery and vein. And also anterior palatine nerve passes via it. Like the greater palatine foramen, via this also passes lesser palatine artery and vein and middle palatine nerve and posterior palatine nerve. The only structure which passes via foramen cecum is emissary vein to superior saggital sinus which has clinical importance in transmission of infections from face to sinuses. Emissory Vein to Sigmoid Sinus. This foramen is located in the anterior surface of mandible and it transmits mental vessels and nerve. Mandibular foramen is presents in the ramus of mandible and transmits Inferior alveolar artery, vein and nerve. It transmits parietal emissary vein from the superior sagittal sinus. Makes easy for anatomy students to learn and understand the structural design of the human body. thanks…started this site for the same purpose.